You are currently browsing the category archive for the ‘Eric’ category. “Why is dinner so difficult? !” I exclaimed, throwing my hands in the air. “It’s not difficult,” Eric said, eyeing me warily. To maximize the time, I asked Eric to do a couple of non-plant-involving things with me. “Why am I the one doing this?” Eric said as he sprinkled Sluggo around the strawberry bed. “That’s fine, that’s just fine.” He finished his task, and completed the other one I’d asked him to do (hammer down the nails in the stakes that used to be the pea trellis), and then started picking up sticks, probably because he feared for his life if he abandoned me now. Meanwhile, I planted peppers. They’re tiny things that may or may not make it, but if they do, I’ll have three Buran peppers, two Poblano peppers, and two jalapeno peppers. No Fresco chilis or Beaver Dams, which disappointed me. I don’t do well starting peppers or eggplants, probably because I don’t coddle them enough. I also planted cilantro and nigella and celery and Mrs. Burns’ lemon basil. I wanted to start putting up bean supports and tomato stakes, but then it was time to eat before we left, so I obeyed Eric’s rather tentative suggestion that we go in for dinner. I’d stopped being annoyed shortly after I snapped at him, and he knows my temper is normally that quick to equalize, but I have to admit I don’t mind having this sort of power while I’m pregnant. Generally the garden and yard are my responsibility along, but perhaps I’ll ask him for more help on the next sunny day, since apparently he’ll be afraid to say no. You get home, glad to be done with the crazy clients and crazier coworkers for the day. About six pounds of tomatoes lounge on the counter amid scraps of paper with weights and dates, or recipes from the Internet, scratched on them. “You have too much energy,” your husband tells you when you kiss him hello and tell him that you’re spending the evening in the kitchen. You put some garlic and the tomato-and-basil sourdough that’s been rising all day in the oven, and tell him brightly that he’s going to help by doing the dishes. You weigh out two pounds of Roma and Zapotec Pleated and Tiger-Like tomatoes, rinse them briefly (“So you have to wash homegrown vegetables too?” your husband complains), and chop them up. You finely dice one onion, marveling that for once it’s not searing your eyes shut with its sulfuric-acid-making gases. You drop some oil into a pot and start it heating while you run outside–smiling at the sunflowers that are finally in full bloom–and pick several basil heads and oregano branches. The safflower seed heads you left for the birds are still there, unmolested, and you wonder whether that will last. Inside, the oil is hot, so you add the onions and saute them until just tender, then add the tomatoes and a teaspoon of salt. You chop the herbs while the tomatoes get up to simmering. You remove the bread and garlic from the oven. The bread goes on a rack to cool and three cloves of roasted garlic go in the tomato sauce. Then you start washing and peeling and chopping your juicy, farmer’s market peaches, five or six at a time. Your husband further complains that since you’re peeling them, why wash the peaches? and you answer by popping a bit of peel, with some delectable flesh attached, into his mouth. He doesn’t ask you any other questions. You reach four cups of chopped peaches, hands dripping, just as the tomatoes are thickening. You wash your hands, throw the herbs in, and let the sauce simmer a bit more while you put the peaches, a tablespoon of lemon juice, two-thirds of a cup of sugar, and a third of a cup of corn syrup into the food processor and hit ON. The peach puree goes into the ice cream freezer to become sorbet while you put water on to boil for pasta and get out the stick blender to smooth out the sauce. Twenty minutes later you’re sitting at the dinner table, enjoying beets with balsamic vinegar and pasta with homemade sauce. The oregano should have gone in sooner, but that’s fixable in the next batch. You’d be looking forward to peach sorbet for dessert, but dinner is engrossing you. “The sauce is missing something,” your husband says, frowning. “What was that sauce we made before? With the canned paste?” You don’t throw anything at him because your stepsister-in-law is there, eating microwaved marshmallows with a fork, but you do resolve not to ask him to taste the salsa you’re planning to try the next night. I stopped in the garden today to see whether any more tomatoes had ripened yet. Four grape tomatoes had, so I seized them and three cucumbers that got large overnight and went inside, noting as I did that the remaining potimarron plant (or did I plant three?) is looking okay. Fruitless, but not drooping. Interesting. “Have a tomato,” I invited Eric, holding out my handful. He popped one in his mouth and his face became beatific. I looked up from the garlic, my eyes unfocused, trying to decide whether I wanted to buy more coriander, considering there’s unripe coriander in the garden at this moment. Then I noticed the seed bags I’d left on the counter. “Here!” I said, thrusting one at Eric. “It’s the coriander. I was saving it for seed, but it’s the same stuff.” He took it and divided it among the jars, leaving enough for me to plant a little for the fall. Then he divided the homegrown dill among the jars, added some non-homegrown spices, and started the vinegar-salt mixture heating. Meanwhile, I went out to the garden, hoping that I’d missed a tomato or two. I picked two grape tomatoes that were orangeish-red, and then I went around the corner and found my first ripe non-grape tomato of the season. 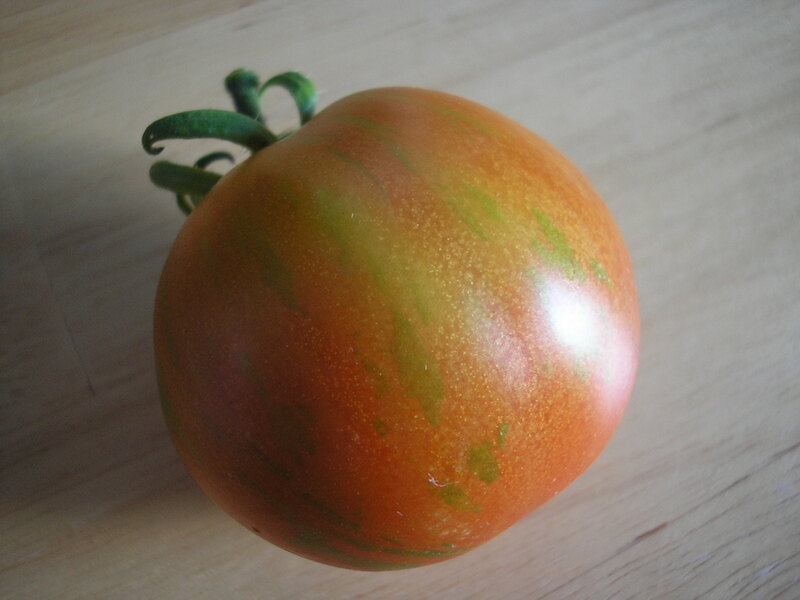 I don’t remember which type of tomato I planted where, but luckily I drew a diagram, and this one is a Tiger-Like. “I wonder how much a grain mill costs,” Eric said. I’m picking all the spinach and a bunch of lettuce this weekend. I will hoard the spinach, but I’m happy to give away lettuce (like Kelly and Meg, though not quite as desperate yet). But I just had an offer to a coworker turned down, and I’m perplexed. Not that it was turned down; it’s lettuce, after all, not strawberries or tomatoes. (Did I mention the day last year when I had an excess of tomatoes so I brought some to work and left them by the microwave? And watched the pile dwindle throughout the day so that I was left with a salutary no-one-wanted-to-take-the-last-one by the close of business?) It’s the reason. “I do eat salads, but I typically cheat and buy the already-mixed bag. So no, but thanks for asking.” What goes into bagged salads other than lettuce, and maybe a little shredded carrot and cabbage? And wouldn’t free mostly-salad be worth grating a carrot or two over the top of it? I guess not. I had my first mostly-from-the-garden dinner last night, if you don’t count the night I had salad for dinner because I spoiled my appetite with ice cream. (It’s really good ice cream, okay?) I intended to have sauteed broad beans, snap peas, and garlic scapes (I have garlic scapes! ), but it turns out that the broad beans need to get much bigger before they’re ready to shell. They have an amazing velvety interior, though. So I picked some Red Russian kale and added that, then sprinkled a little lemon juice over it all and had it with leftover rice. 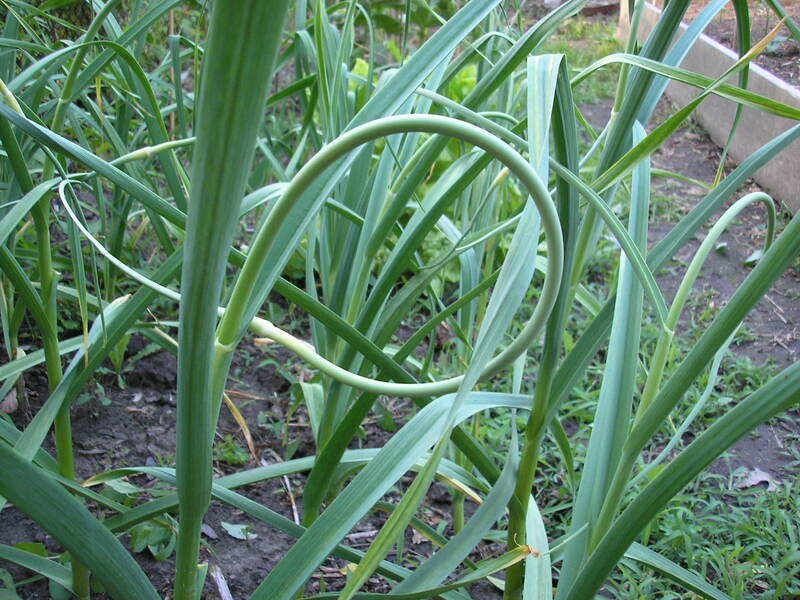 I read up on garlic scapes before cooking them and was pleased to note in this article that they have a much milder flavor raw (in pesto!) than garlic cloves, and that you can eat them and “still kiss your kitchen mate.” This was a terrible lie. I bit into one and yelped, and Eric moved rapidly out of reach as the scent reached him. But cooked they did become mild, with a great texture, very asparagus-like. I’d love to try cooking them as I would asparagus, once the remaining ones get longer. Maybe in risotto. Or pasta. Or pizza. Or alone. Eric has also told me that he’ll eat more salad if I simply walk indoors with it and tell him that it’s what we’re having for dinner. I had thought being able to see the lush, close-packed lettuce patch from the window, and hearing my frequent suggestions of “salad with dinner?”, would have encouraged him to consider eating salad more often. But if all I’ve got is his essential laziness when faced with a dinner fait accompli, I’ll take it. I’m planning my attacks in green bean, corn, and zucchini season already. I did plant the feverfew okay. It and the hyssop are up–just barely, tiny tendrils that nevertheless relieve me greatly, as the solanaceae and lavender are still not up and are driving me crazy. (The shiso are. Did I say that before? They’ve been up for days. Also the lettuce.) Eric says I need to stop fussing, that my seeds take two weeks to germinate and it hasn’t been that long. I’m astonished he noticed. Maybe he didn’t notice, maybe he just said it to get me to shut up. He seems to have taken to the local/organic thing pretty hard, too. We decided on tacos for dinner and headed straight to the organic produce section. (Um, after the Easter candy section. It’s Cheap Candy Day! They still had some Cadbury Cream Eggs and some Dove eggs and some M&Ms which we needed for trail mix anyhow!) “I wonder where these are from,” he said, looking at the bananas after we’d picked out some carrots and lettuce. And then, “Damn it, I wish I weren’t thinking about this. Why did you have to give me that book?” notwithstanding he recommended it to his brother-in-law yesterday. We went to our friends’ housewarming party on Saturday and I met a kindred spirit, a woman who’s planting up as much of her ten acres as she can (part of it as meadow), bakes with sourdough, and has promised me some guano from her barn in exchange for some seeds and some of my sourdough starter. I’m not sure how many of the people at the party could believe that particular conversation. Regardless, I’m getting guano! I’m going guano crazy if this snow doesn’t disappear soon. The weather channel is threatening more tomorrow. I can’t remember where I found this article. Regardless, it gives me twin feelings of smugness–see! This isn’t a weird hobby, it’s a perfectly valid occupation and a good survival tactic for current economic times!–and worry. “Egg prices were 19.5% higher in June 2007 than they were the previous June…apples 11.7%, dried beans 11.5% and white bread 9.6%.” Notwithstanding that we don’t eat white bread (and in fact I’m making most of our bread these days, probably all of it once I find the perfect toasting bread and try out a tortilla recipe or two), those numbers make me unhappy. I tracked my garden expenses last year purely to see whether gardening was going to cost me more than it provided. The answer was no. This year, with my garden infrastructure mostly in place (well, for the established plot; the new one needs a little work) and my seed costs lower due to saving and trading, I should be able to save much more money overall. And I’m afraid I’ll need to. As I mentioned, Eric lost his job recently, so we’re living on my salary now, which is enough to make ends meet but not by much. We’ve also got his summer tuition to pay for to get him the last couple of classes for his integrated-science certification and his master’s degree, which will greatly increase his chances of employment later on. He’ll get a job in the fall whether it’s teaching or not, but until then, he’s student-teaching and so things are tight, and we’re going to have to either take a big loss on some stocks we have or take out a loan. I’ve been worried about money, careers, the economy, the future in general lately. I’m sure many people have. And knowing that everything, including food, is getting more expensive very quickly and will probably get much worse doesn’t help. I’m very glad that I’m already a gardener, of course. I may not be a great one, but I have the basics down; I have a seed stash and a little knowledge on how to renew it; I have a set of canning jars; I have the willingness to eat what I cook and to cook what I have on hand. I’m hardly ready to feed the two of us on the garden alone, but I’m ready to help. I hadn’t planned to track my expenses and production this year, but I’m thinking I will, in part so that I can plan better for years after. Probably the economy and our job situation will get better (historically, they always have, but I’m feeling morbid and paranoid these days–maybe it’s the snow); but if they don’t, I and my shovel and my Hutterite beans will be ready. I may not be able to actually garden right now–did I mention there’s another snowstorm expected tomorrow? GRUMBLE GRUMBLE–but should the weather ever cooperate, I’ll be taking some stress off of us this year by taking some expenses off the budget. And I’ve got my husband convinced that I’m spoiling him by doing so. This gardener is doing all right. Now all I’ve got to do is figure out how to get him to eat squash. Last night we made lasagna with salad and homemade bread for dinner. “Now I’m wondering where this lettuce came from,” Eric said as we sat down to eat. “And THAT ANNOYS ME.” I mentioned I got him to read Animal, Vegetable, Miracle, right? Eric started out very much not interested in this strange local/organic mumbo-jumbo I was talking about. And, in fact, I’m learning as I go and therefore some of what I was talking about probably was, and possibly still is, mumbo-jumbo. But I’m learning, and I’m in earnest about it; and through the magic of 1) continual, if not incessant, discussion, 2) getting him to read a well-written book, and 3) hooking him on better-tasting food, Eric is coming around to the idea that local/organic mumbo-jumbo maybe is something worth paying attention to–if for no other reason than that it means tastier meals and lower grocery bills. He also supports my gardening obsession as our ticket onto our friends’ kibbutz–but that’s another post. He’s already agreed to come with me to the farmer’s market this year, which is better than I got last year, and is possibly as eager as I am for the day when the ground finally stops being frozen or sodden or both at once and I can plant some lettuce and scallions for our spring salads. I thought with despair of how behind we must be this year…until I went through last year’s picture and found what’s currently the new header. It was taken in May. We still have a long way to go, baby. It’s off to the farmer’s market for us this Saturday.